David Keilin was born on March 21, 1887 in Moscow, Russia, the son of Polish parents. His father was a small businessman and a landowner. One of his earliest memories was the return of his family to Warsaw. Because of his poor health and suffering from asthma he was taught at home by a governess and did not attend school until he was ten years old. He attended the Gorski School, a private school, until he was seventeen, showing an aptitude for literature, mathematics and languages. In 1904 Keilin went to the University of Leige in Belgum where he completed a two year program in natural sciences in one year. Advised that with his poor health would not be able to stand the strain of medical studies in 1905 he moved to Paris, where he read books at the Bibliotheque St. Genevieve and attended philosophy lectures at the College de France. It was a chance encounter with Professor Maurice Caullery that began his career in biology. One afternoon, in order to get out of the rain, Keilin found himself in a building in which Caullery was lecturing. He was impressed with the lecture and began attending the class three times a week, thus began his life long friendship with Caullery. It was Caullery who offered him a position at the Laboratorie d'Evolution and urged him to enroll at the Sorbonne, where Keilin began classes in zoology, geology, botany, and embryology. Keilin quickly became not only a expert laboratory researcher but also a avid field biologist. In 1915 Keilin earned his doctorate with a thesis on the biology of Diptera larvae. In 1915 he accepted the invitation of G. H. F. Nuthall to become a research assistant in medical entomology at the Quick Laboratory at Cambridge. In 1916 he was appointed Assistant to the Quick Professor and became affiliated with Magdalene College, an affiliation that lasted throughout his life. Although initially the conditions under which he worked were cramped, several workers sharing the same small laboratory, Keilin found the group congenial. In 1921 conditions improved when the Quick Laboratory moved in to the newly built Molento institute. Keilin's early work (up until 1920) largely dealt with descriptive biology and morphology. After 1920 his work became more experimental. Between 1922 and 1924 Keilin was studying the life cycle of the horse bot fly (Gasterophilus intestinalis) and observed that the red coloring of the larval stage disappears in later stages. After preforming direct-vision spectroscopy on these pigments he found that the two banded pattern of the larval stage becomes a four banded pattern in the adult fly. He observed the same four banded pattern in other insects, yeast and bacteria. In 1924, when working with a suspension of yeast dissolved in water, he observed that the four banded pattern disappeared when the suspension was shaken and then slowly reappeared. It was this observation and the fact that the disappearance was inhibited by cyanide (an inhibitor of oxidation) that allowed him to conclude that the pigments he was studying were being oxidized by atmospheric oxygen and then re-reduced. Keilin called the proteins that have these pigments cytochromes. Although these pigments had been observed before, it was Keilin who elucidated their importance in the production of cellular energy. These are the enzymes, located on the inner membrane of the mitochondria, which while transporting electrons build the proton gradient that is used to produce ATP (for a review of cytochrome function in the electron transport chain see here). Keilin spent the rest of his career researching cytochromes and elucidating their function. 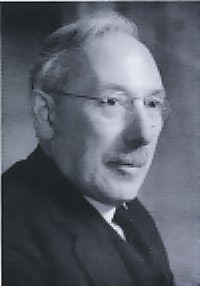 In 1931 Keilin succeeded Nuthall as Professor and Director of the Molento Institute. In 1952, upon reaching the age of 65 Keilin retired from both posts, but continued active research until his death. Keilin was appointed the the Royal Society in 1928 and he was awarded the Copley Medal in 1952. Keilin died on February 27, 1963.